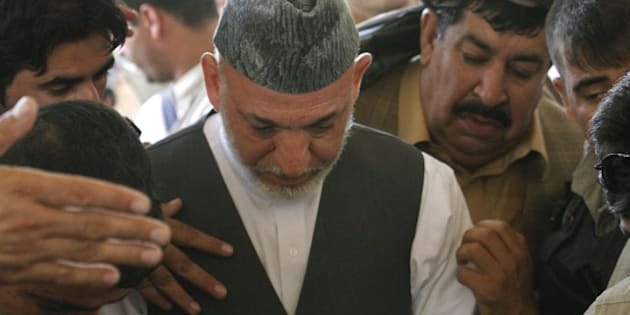 THE CANADIAN PRESS -- KANDAHAR, Afghanistan - Afghan President Hamid Karzai wept and made a plea for peace as he led thousands of mourners at the funeral for his murdered half brother in Kandahar. Karzai says even though the Taliban claimed to have killed his brother, he still wants to talk with them. The service for Ahmed Wali Karzai was held at a sprawling guest house in the city, which has been locked down tight in anticipation of possible violence. AWK -- as he was known -- was gunned down by a close family associate at his heavily fortified compound in the city Tuesday. The Taliban claimed responsibility for the murder, although many who knew the killer said they doubted he was associated with the insurgency. Karzai's body was buried in the family plot in Karz, a village about 30 kilometres outside of Kandahar city.